Last year around this time, the Jungle Theater introduced #TCTheater to the wonderfully imagined world of Jane Austen's Pride and Prejudice in the years after the novel's conclusion, via playwrights Lauren Gunderson and Margo Melcon. I called Miss Bennet: Christmas at Pemberley "very reminiscent of Jane Austen, but also fresh and modern and new. It's a witty, smart, utterly charming new play that celebrates not just literal sisterhood, but women working together and supporting each other, both onstage and behind the scenes." Artistic Director Sarah Rasmussen notes that they "had so much fun we co-commissioned this companion piece." 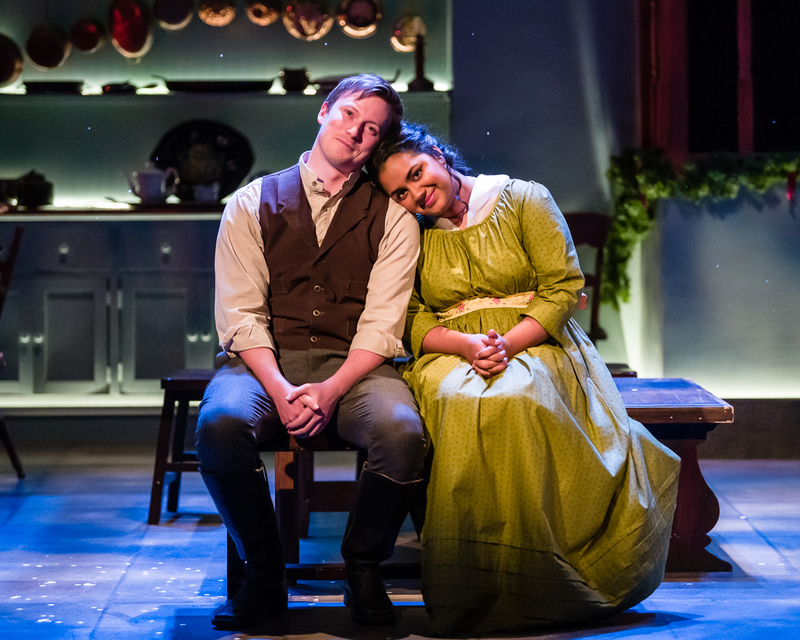 I'm happy to report that The Wickhams: Christmas* at Pemberley, now playing at the Jungle as part of a rolling world premiere, is just as delightful as the first one. Friends, I want to return to Pemberley every year, at Christmas or during the heat of summer, upstairs or downstairs, starring any (or all) Bennet sister(s). The world and characters that Lauren and Margo have created is so rich and wonderful, with endless story possibilities. These plays are everything you love about Jane Austen, but with more modern sensibilities. Sheer delight! Miss Bennet focuses on bookish sister Mary, who receives short shrift in the original novel, and re-imagines her as a smart, practical, independent woman. In the same way, this play goes deeper in the character of Lydia, who you may remember married Mr. Wickham in a scandal in the novel, and in Miss Bennet keeps up the facade of a happy marriage. The Wickhams allows Lydia to be not just a silly and thoughtless girl whose every decision is made for her, but a more complex young woman who chooses her own life. 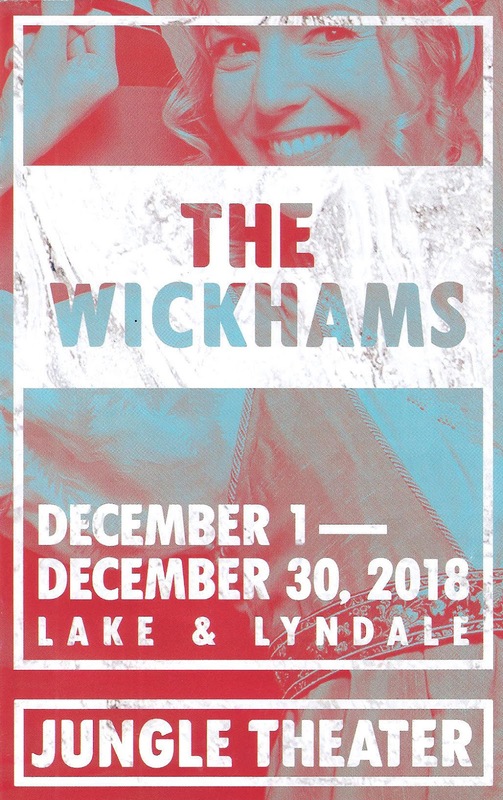 The Wickhams feels like Jane Austen for the #metoo era. George Wickham represents that charming scoundrel who appears so often in novels (and in real life), and turns that idea on its head, revealing that it's actually not charming to deceive and mistreat women, and women both real and fictional are no longer going to put up with that kind of behavior. Hooray! In a clever twist, the playwrights have set the entire play downstairs in the servants' quarters, giving it a Downton Abbey feel. The busy Christmas holiday is happening upstairs, with many family members mentioned (Jane is pregnant, Mary is still with Arthur, and Kitty is... hopefully the subject of the next play). 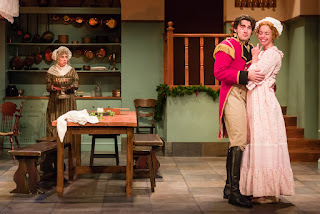 The setting allows the play to focus on the only Bennet sisters who venture downstairs - mistress of the house Elizabeth Darcy, along with her husband Mr. Darcy, and of course Lydia, who is visiting alone, her husband away "on business." When said husband arrives at the kitchen door drunk and bleeding, the good Mrs. Reynolds (super efficient and wonderful housekeeper a la Downton's Mrs. Hughes) tries to hide him from the master of the house, who has banned him permanently from the premises. Servants Brian, who grew up in the house, and Cassie, who has only just arrived to help out with the Christmas rush, are appalled at the rude intruder, and discover his real reason for being there. Of course the Darcys and Lydia eventually find out he's there, at which point Lydia is told the whole truth, painful as it is, and is allowed to determine her own fate. The Wickhams reunites much of the team from Miss Bennet, including wonderful director Christina Baldwin, now the Jungle's Resident Director, who once again sets just the right tone and pace for the show, a mix of light comedy and the more serious issue of Wickhams' abuses. Actors Kelsey Didion, Sun Mee Chomet, and James Rodriguez reprise their roles as Lydia, Elizabeth, and Mr. Darcy, respectively, and once again beautifully embody these familiar characters. New this year is Nate Cheeseman as Wickham, alternately charming and obnoxious. Among the downstairs staff we have the endlessly watchable Angela Timberman, with the perfect mix of warmth and sternness as Mrs. Reynolds, and relative newcomers to the #TCTheater scene Roshni Desai and Jesse LaVercombe as Cassie and Brian. You know those memes "find someone who looks at you like...?" 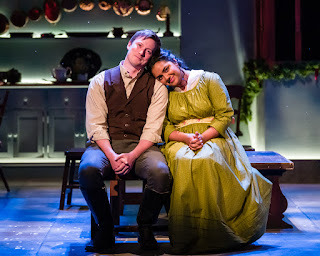 The next one needs to be "find someone who looks at you the way that Jesse LaVercombe's Brian looks at Roshni Desai's Cassie," a look so full of admiration, surprise, delight, respect, wonder, and maybe even love that I smiled each time I saw it (which was pretty much the entire play). And Roshi is deserving of that look, her Cassie is a smart, modern, independent woman, who still has room in her life to receive such a look and maybe even return it. At first I was a little disappointed at the thought that we'd spend the whole play downstairs, there was such fun happening amongst the family in the beautiful upstairs! But I soon got over it, because as those of us who watch Downton Abbey know, there's just as much drama downstairs. And while the setting may not be as elegant as other rooms in the grand estate that is Pemberley, the big house kitchen is smartly and efficiently represented by Chelsea M. Warren's set design, with a glowing fireplace, many workspaces, kitchen implements, greenery, stairs leading to the main house, and even sheets hanging to dry by the fireplace. Costume designer Sarah Bahr returns from last year and continues the tradition of the gorgeous empire waist dresses and three-piece suits for the upstairs dwellers, as well as practical period clothing for downstairs. Down to the charming image of Pemberley with snow softly falling displayed on the curtain pre-show, everything about the design of the show is pitch perfect. 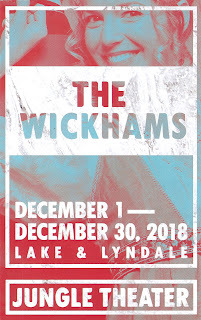 The Wickhams: Christmas at Pemberley continues through December 30. You would be wise to make reservations early because with a show this delightful, coming off of high expectations from last year, the charming little jewel box of a theater will likely sell out many performances. It's a pleasure to return to Pemberley, and I hope Jungle continues this tradition for many years to come. Bennet sisters forever! *You can read about all of the holiday shows I've seen here.